Products for well water, iron, copper and contamination problems. Scroll down to browse through information about products for treating well water, iron, copper, manganese, phosphates, minerals, sulfur, staining and discoloration problems, in all types of pools and spas. The Website Store Directory contains an alphabetized listing of all products for sale. We don't just sell products. We help you make a better-informed choice, by providing all the information, you might require. Need ordering help? Scroll down the page, for the Order Desk Telephone Help Number. All items ordered will end up in the same shopping cart, no matter which page of this website, the items are located. All Major Credit Cards and PayPal are accepted. Order one today. How to deal with metals, stains, discoloration, sulfur contamination and odor problems. 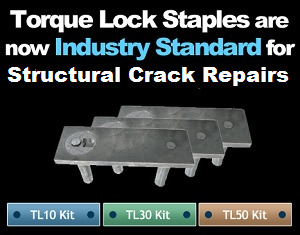 These products remove metals and avoid future problems. 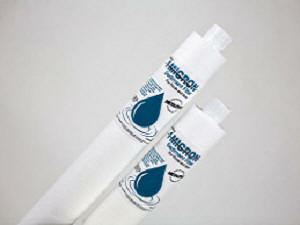 * The MetalTrap Stain Reversal Kit is also bundled with a MetalTrap Filter (choice of 3 sizes). The first step is understanding which products are best suited to solve the problem. Treating pool and spa stains and discoloration is more complicated, than simply adding one product. You don't just simply want to eliminate the problem, you want to prevent its recurrence, as well. Don't keep fighting the same battles every season. Use the right products and you can recurring problems. Below is a brief description of the role each type of product might play, in achieving a long-lasting to permanent solution. How much chemical will be required, may depend on the metal concentration. If you know a presence of copper or iron iron exists, you should consider being able to test, for these metals. Below are three easy-to-use test options. ● MetalTrap Filter: a cartridge-like filter, that attaches to the garden hose and water line, used to add new water to the pool or spa. Available in 3-sizes, it helps you avoid adding dissolved iron, copper and manganese, that might be present in the source water. Keep new metals out and there will be fewer problems. Especially useful, when well water or low quality water is being used. Available in pool or spa sizes. If sediments are present, in addition to dissolved metals, the MetalTrap Dual-Cartridge Filter is the preferred choice. ● MetalTrap Dual-Cartridge Filter: well water or water from poor quality sources can contain sediments, as well as dissolved metals. Sediments will clog the standard MetalTrap Filter, shortening its life. The MetalTrap Dual-Cartridge Filter has a 5-micron Sediment Filter Cartridge, that is reusable and washable, to help keep sediments out of the second MetalTrap Filter Cartridge. This second cartridge is replaceable and is the one that removes the dissolved metals. This is how to keep sediments and metals, from being added with new water additions, when lower quality water sources are used. ● MetalTrap 5-Micron Filter Cartridge System: the 5-Micron, Pleated, Sediment Filter is washable and reusable and has a long functioning life. It will help remove sediments, such as oxidized metals, sulfur, contamination and more. Comes complete and ready to attach to a garden hose. ● MetalTrap 1-Micron Pre-Filter: a filter cartridge that attaches to the garden hose and removes fine debris, sulfur, trace pharmaceuticals, odor problems and trace impurities. Available in pool or spa sizes. ● Liquid MetalTrap: a true chelating agent, that converts copper, iron and manganese, into a form that can avoid stains and discoloration. It works over a wide pH range, does not degrade into phosphates, and is most effective against, when the metals concentrations are under 1 PPM. It will not remove stains, by itself. It is not the best solution, when metals are coming from a water source, such as a well. To do that something else is required. ● MetalTrap Stain Remover: this non-toxic chemical can dissolve stains and discoloration, caused by iron, copper or manganese, from all types of pool or spa surfaces. Once the stains have been eliminated, these metals are now back in solution. Unless you follow, with another type of treatment, the product will surely return, as the metals are still in the water. ● Total-Trap Pool Refresh: once the stains are removed, using MetalTrap Stain Remover, the addition of Total-Trap Pool Refresh will convert the iron, copper, silver and manganese into a form, that can be filtered or vacuumed, out of the pool or spa. This regiment leads to the physical removal of the metals and helps avoid recurring problems. This is a convenient "No-Drain" way to remove dissolved metals and phosphates, that might be present. ● MetalTrap Stain Reversal Kit: this 3-part regimen uses MetalTrap Stain Remover to remove the stains and discoloration. This is followed, by the addition of Total-Trap Pool Refresh, to precipitate the iron, copper, manganese and phosphates, for permanent removal, by filter and vacuuming. A dose of Liquid MetalTrap is added to scavenge up any lingering trace metals. The 3 products and packaged together, providing bundled savings. You must consider where the metals came from. If it came from overuse of copper algaecides, ionizers, heater corrosion or a mud slide, care can be taken not make the same mistake again. However, it the water source contains iron, copper or manganese, you will have future problems, whenever you top off the pool or spa. Adding metal-removing filter will allow you to avoid adding problematic metals, every time new water is added. The MetalTrap Stain Reversal Kit-PLUS Kit includes a MetalTrap Filter, for just this reason. Larger pools, over 15,000 gallons may have to order more than one kit or order additional quantities of the individual chemicals. Treat the problem right and cease to be an unsightly annoyance. ● MetalTrap Stain Reversal Kit-Plus: contains the same treatment chemicals found in the standard MetalTrap Stain Reversal Kit, plus a choice of one of 3 models of the MetalTrap Filter. The addition of the MetalTrap Filter helps assure that more metals are not added, with subsequent additions of new water. Larger pools, over 15,000 gallons may have to order more than one kit or order additional quantities of the individual chemicals. Treat the problem right and cease to be an unsightly annoyance. Scroll down to view stain-discoloration solutions and to place an order. Removes Dissolved Iron, Copper, Silver and Manganese, from source water. 3 Sizes Treat up to 10,000, 25,000 or 50,000 Gallons. The METALTRAP utilizes a new filtration media, that chemically reacts with dissolved heavy metals, such as iron, copper, manganese and silver and permanently removes them from the water. These unique, patent-pending units selectively filter out stain-causing metals and helps protect your pool or spa from unsightly rusty, tan, brown, green, black or gray stains. Units are available in 3 sizes to process up to 10,000, 25,000 or 50,000 gallons of water, depending of the level of contamination and the size of your pool or spa. The gallonage ratings are based on a total metals content of 1 PPM. ● The METALTRAP Filter actually removes problematic, dissolved metals, from the water, before the it is added, to the pool or spa. ● Almost a necessity with well water or poor quality source water. ● Removes iron, copper, silver and manganese, before they get into the pool or spa. ● Available in 3 sizes for pool and spa use: 10,000, 25,000 and 50,000 gallons. ● Removes up to 1 PPM of heavy metals, based on its rated gallon capacity. ● Simply attach to a standard garden hose. ● Helps avoid recurring staining and discoloration problems, in pools and spas. The METALTRAP Filters are all ideal for Spa use. Spas are typically drained and refilled every 3 months, to avoid the buildup of byproducts and organic materials. A unit suited for a 10,000 gallon pool, can be used to refill a typical spa, 20 or more times, depending upon the actual metal content. The savings in treatment chemicals will more than make this a worthwhile investment and help provide better water quality, as well. If your source water contains sediments, you should instead consider the MetalTrap Dual-Cartridge Filter, as it includes a washable, reusable 5-micron sediment filter. If sediments are present, the first cartridge, in the Dual-Cartridge model, will remove the sediments. In the regular MetalTrap Filter, sediments can clog the filter, resulting in a blocked or leaking cartridge. Higher metals levels will require larger or additional METALTRAP Filters. With 1 PPM or less of total metals, recirculate at 8-10 gallons a minute. With 1-2 PPM of total metals, recirculate at 4-5 gallons a minute. Proportionally adjust for higher metals levels, both in terms of flow rate and METALTRAP gallonage rating. Scroll down the see the entire selection of stain and discoloration treatment options. Ideal for use with or without an auto-filler or auto-leveler. If your water source contains dissolved metals, as well as suspended sediments, the METALTRAP Dual-Cartridge Filter would be a better choice. It features a washable, reusable 5-micron sediment filter and replaceable MetalTrap Filter cartridges, for greater economy. The first, washable, reusable, 5-micron filter cartridge removes sediments, which might, otherwise, clog the second MetalTrap cartridge, intended to remove dissolved heavy metals. The MetalTrap Dual-Cartridge Filter is a real must-have product, when an auto-filler is being used. ● The METALTRAP Dual-Cartridge Filter actually removes dissolved heavy metals, as well as fine sediments, from the water, before it is added, to the pool or spa. ● This is almost a necessity with well water or poor quality source water. ● Removes sediments, iron, copper, silver and manganese, before they get into the pool or spa. ● 3 sizes for Spas and Swim-Spas or Smaller and Larger Pools. ● Available in 2 variations. One models utilizes 0.75-inch garden hose. The other use 1-inch PVC piping. ● The sediment filter is washable and reusable and lasts for extended periods of time, with proper care. ● The MetalTrap Filter can remove up to 1 PPM of heavy metals, from 28,000 gallons of water. Once exhausted, the cartridge needs to be replaced. ● Replacement cartridges are available, for all models. If your source water contains sediments, the MetalTrap Dual-Cartridge Filter is the preferred way to treat the problem, as it includes a washable, reusable 5-micron sediment filter. Higher metals levels will require larger or additional METALTRAP Filters. With 1 PPM or less of total metals, recirculate at 8-10 gallons a minute. With 1-2 PPM of total metals, recirculate at 4-5 gallons a minute. Proportionally adjust for higher metals levels, both in terms of flow rate and METALTRAP gallonage rating. Use it for an initial fill-up or to treat multiple additions of new water. The replacement cartridges below and be used the above model. Choose the size, that best suits the needs of your spa, swim-spa or pool. The replacement cartridges below can be used with both of the above models. Washable, reusable, cartridge holder system, for pools, spas, swim-spas. If your water source contains dissolved metals, as well as suspended sediments, the METALTRAP Dual-Cartridge Filter would be a better choice. If the problem is limited to sediments, then the MetalTrap Single-Cartridge 5-Micron Filter System should suffice. It features a washable, reusable. pleated, 5-micron sediment filter, for greater economy. This washable, reusable, 5-micron filter cartridge removes sediments, which might, otherwise, end up being added, along with any new water additions. Replacement filter cartridges are available, should the need ever arise. ● The METALTRAP Single-Cartridge Filter actually removes fine sediments, from the water, before it is added, to the pool or spa. ● Use it for an initial fill-up or to treat multiple additions of new water. ● Removes oxidized metals such as, iron, copper, silver and manganese, before they get into the pool or spa. ● Removes sulfur and other types of contamination. ● Helps avoid recurring problems, in pools, spas and swim-spas. ● How much water can be filtered, before requiring washing the filter cartridge, will varying depending on the nature and amount of sediments present. If your source water contains dissolved heavy metals, such as copper, iron or manganese, the MetalTrap Dual-Cartridge Filter is the preferred way to treat the problem, as it includes a washable, reusable 5-micron sediment filter, as well as a second cartridge, that removes the dissolved metals. Having the water tested, for iron, copper and manganese, will give you a better idea of the extent of the problem and help you make a better-informed product choice. Available in two sizes: 20-inch Pool Size and 10-inch Spa Size. Treats 10,000 - 20,000 Gallons. Nothing is better than actually removing organic micro-contamination, from the water, before it gets into the pool or spa. That is what the MetalTrap 1 Micron Pre-Filter does. Even the best quality water has inorganic and organic micro-contaminants that are too small to see or for a pool filter to remove. The most efficient filters can only remove particles of 3-5 microns or larger. This 1 Micron Pre-Filter can remove particles down to 1 micron in size: sulfur, hair, body oils, cosmetic residues, skin, blood cell, dirt, silt, sediments, oxidized metals and even some types of viruses, bacteria and algae. ● Units are available, in two sizes, for a variety of pool, spa and swim-spa sizes. ● Pool size treats up to 20,000 gallons of water and is 20" (50.8 cm.) in length. ● Spa size can also be used with smaller pools, treats up to 10,000 gallons and is 10" (25.4 cm.) in length. ● No installation is required!!! Simply attach to a garden hose. ● Removes odor-causing sulfur, organic contaminants, body oils, dead skin and more. ● Get better quality water and reduce chemical costs. ● Removes oxidized metals such as copper, iron, silver and manganese. ● Preventing problems saves on chemical treatment, time and effort. One bottle treats up to 10,000 gallons. Liquid METALTRAP is a unique metal deactivation and removal formula, that helps prevent metallic ions, such as copper, iron and manganese, from discoloring or staining underwater pool or spa surfaces. Helps prevent new ones, but should be used with MetalTrap Stain Remover to remove stains. Liquid METALTRAP is effective at the pH found in virtually all pools. It does not lose strength at pH 7.8 or higher and is ideal suited for use with all brands of salt chlorine generators. ● 1-quart (954 ml) treats 10,000 (38,000 L) gallon pool, with up to 1 PPM of metals. ● 4-ounces (119 ml) treats a 500 gallon (1900 L) spa. ● Contains no phosphates. Does NOT contain organic phosphonic acid. ● This a true chelating agent. ● Works across the full pH range. Other products may not work about a pH of 7.8. ● Treats and prevents most stains caused by heavy metals, such as iron, copper and manganese. One pound treats 10,000 gallons. METALTRAP Stain Remover is 100% active, all-natural, non-toxic chemical that reduces iron, copper and manganese to a more soluble and less colored state. It contains none of the toxic oxalic acid. For best long-lasting, results, follow by the addition of Pool Refresh, which will allow you to permanently filter or vacuum the precipitated metals, out of the pool or water. When dealing with low levels of heavy metals, you can alternatively follow with Liquid METALTRAP. The metallic ions will be complexed (chelated) and remain in solution, in a less colored state. ● 1-pound per 10,000 gallons. One bottle contains 1.75 pounds. ● 2-ounces treats a 500 gallon spa. ● 100% active, non-toxic reducing agent. ● Helps remove stains, by making the metallic ions more soluble. ● Only requires a pH of 6.8-7.2. Treats up to 15,000 gallons. ● Removes phosphates, iron, copper, manganese and silver. ● No need to drain the pool or spa. ● Refreshes the water and removes phosphates, heavy metals and more. ● When you don't have the option of draining a pool or spa, POOL REFRESH can be the perfect solution! ● Helps lowers Total Dissolved Solids (TDS), making draining less likely. ● One quart of each product treats up to 15,000 gallons. ● Two-Part system for better performance and results. Draining a pool is not always a safe option. Drought restrictions have to be considered. POOL REFRESH is a new patent-pending technology, that refreshes existing pool or spa water, back to the quality of new water. There is no need to drain the water or refill an existing pool or spa. 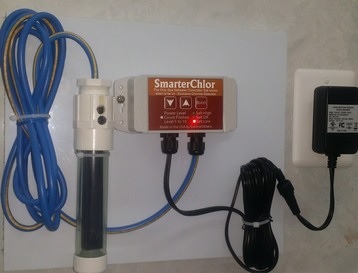 This unique 2-part system, is simply added to the skimmer, with the filter running and precipitates most accumulated chemicals and impurities. Afterwards, it is either vacuumed or filtered out of the pool or spa. After the filter has been cleaned, the water will be refreshed, just like new. POOL REFRESH reacts with and removes stain-causing metals, such as iron, copper, manganese and silver. Also, removed are phosphates which can promote algae growth, undissolved minerals, such as calcium and magnesium, which can cause scaling and cloudy water and other unwanted salts, sediments and impurities. Helps lower the Total Dissolved Solids (TDS), making water replacement less likely. One-quart of each product treats up to 15,000 gallons (38,000 L) of water. Spas can use proportionally smaller amounts. Unlike other stain treatments on the market today, the METALTRAP Stain Reversal Kit, includes the revolutionary, patent-pending Total-Trap POOL REFRESH product. This unique product has been specifically formulated to permanently remove the heavy metals from your water, making a recurrence, of staining or discoloration, less likely. The METALTRAP Stain Reversal Kit includes the following: 1-quart of Liquid METALTRAP, 1-1.75 Bottle of METALTRAP Stain Remover and a combination package of Total-Trap POOL REFRESH Parts A and B. Larger pools need to add additional kits, based on volume. No Need To Drain!!! No Acid Wash Required!!! Metal stains can be many colors: green, black, red, brown, gray, purple and many variations of each. Can the stain be brushed off? If yes, then the area may be organic debris or algae. Have you tried Chlorine? If yes and stain persists, it’s likely to be metallic in origin (Iron if light brown, Copper if bluish green, Silver if dark gray, Manganese if dark brown or purple). No expensive Stain Identification Kit is needed. A simple “lemon test” helps to be sure, that the problem is metals, before proceeding with the stain reversal treatment. Cut a lemon in half. Rub on a small stained area. For more stubborn stains, squeeze the lemon and allow the lemon on the stain for a few minutes. If the stain changes, lightens or lifts in any way, you know the problem is metals and that MetalTrap Stain Remover will remove the stain. It is all-natural, metal removing formula, that contains no toxic oxalic acid. It chemically changes iron, copper and manganese stains, on pool and spa surfaces such as fiberglass, vinyl liners, plaster finishes, plastic returns, main drains and grout, to a more soluble and less colored form. Metal stains are less likely to recur, when this METALTRAP Stain Remover is followed by application of Total-Trap POOL REFRESH. To avoid adding more metals, when new water is added, consider attaching a MetalTrap Filter or a MetalTrap Dual-Cartridge Filter, to the garden hose. If you want to break the cycle of recurring metals stains, then a MetalTrap Filter or MetalTrap Dual-Cartridge Filter can be invaluable. In 5 steps, you can put this all behind you. The METALTRAP Stain Reversal Kit, Item MTSR-KIT-4, includes the following: 1-quart of Liquid METALTRAP, 1-1.75 Bottle of METALTRAP Stain Remover and a combination package of Total-Trap POOL REFRESH Parts A and B. The same Kit is also bundled with one of 2 sizes of the MetalTrap Filter, for added savings. Don't just remove the stains . . avoiding setting the stage for a recurrence, of the problem!!! Scales up to treat pools and spas, o f all sizes. In addition to containing the complete MetalTrap Stain Reversal Kit, one of 3 sizes of the MetalTrap Filters is included. This provides the means to remove any dissolved iron, copper, silver or manganese, from new water added, after the pool or spa is treated. This is what's needed to remove stains and prevent a recurrence!!! No need to drain the pool or spa!!! The MetalTrap Filter helps avoid adding metals, when new water is added. Scroll up for more information on the MetalTrap Filters and the MetalTrap Stain Reversal Kits. The combination of the two products helps assure better, long-lasting results. 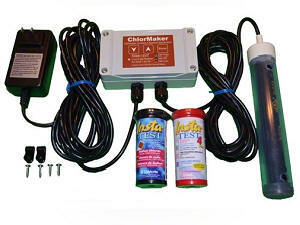 Pools over 15,000 will require additional chemicals or MetalTrap Stain Reversal Kits. Don't swim with metals or contaminants . . . remove them permanently. For all types of pools up to 20,000 gallons. 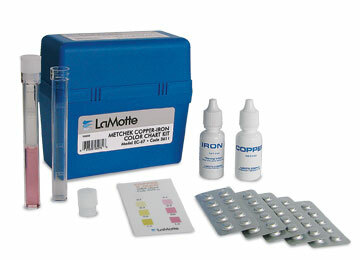 This low range tester helps detect and prevent iron problems.